GeekSpy Forums - Best Mobile Game out there? 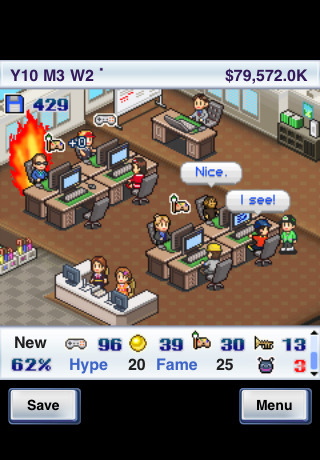 GeekSpy Forums | Gaming Discussion | Best Mobile Game out there? Surely it's "Game Dev Story" - the most addictive little pocket of fun on the mobile market. I spent almost and entire week playing and then replaying it when I first bought it for a messily $2. Basically, as the name suggests you run a game development company. There's also meant to be another popular mobile game, which is equally addictive where you run an airport. I put many, MANY hours into this game. It was awesome, but then I got a job again. Right now I'm into Rayman. It's not a long game, but it's fun and pretty, and I loved Origins on the 360. I recently tried Symphonica, by SquareEnix. It's a Free Sample. The game itself is along the lines of the Guitar Hero games, but instead of hitting colored buttons, it's played with taps and different gestures. Quite interesting, but like other SquareEnix games on iOS, once you add up, it's pricey. Anyone trying Baldur's Gate on iPad? Can't stop playing Plague Ice. Can't. Stop. I got Sonic Jump as a freebie from Apple over the Holidays... I'm addicted to it. Yeah, that's a fun one. Galaxy on Fire is not a good mobile game per se since it's not quite playable in the short bursts that one sometimes has. But I'm still loving it. It's just like freelancer. So much that I'm impressed that MS hasn't sued. Tablet/phone gaming simply doesn't do it for me. Had Civ:Rev and I went "meh" for the first time ever with a CIV game. Played a bit of airport tycoon II which was fun untill I figured out the sure win strategy which makes it a *complete* waste off time. While typing waste of time I thought by myself "but gaming is a waste of time by definition, silly".